after some serious time off, i was quite excited to be back in attendance at nrw. a couple weeks ago the crew grabbed dinner at farm burger of decatur while i was out of town, so last week we decided to mix cuisines up and go for italian. i’m going to spoil the ending for you right now: baraonda was excellent! it may be my favorite spot since 1kept, which we all know i enjoyed immensely. dinner at baraonda was an intimate event, just nathan, jon, turner, and me. even though i love our circus-sized group outings, i was actually quite excited for the night. our cozy table provided for great conversation among the busy city streets of atlanta. after being seated on the patio (you all know how i love to eat outside when the weather is right), our waiter for the evening oscar greeted us kindly. 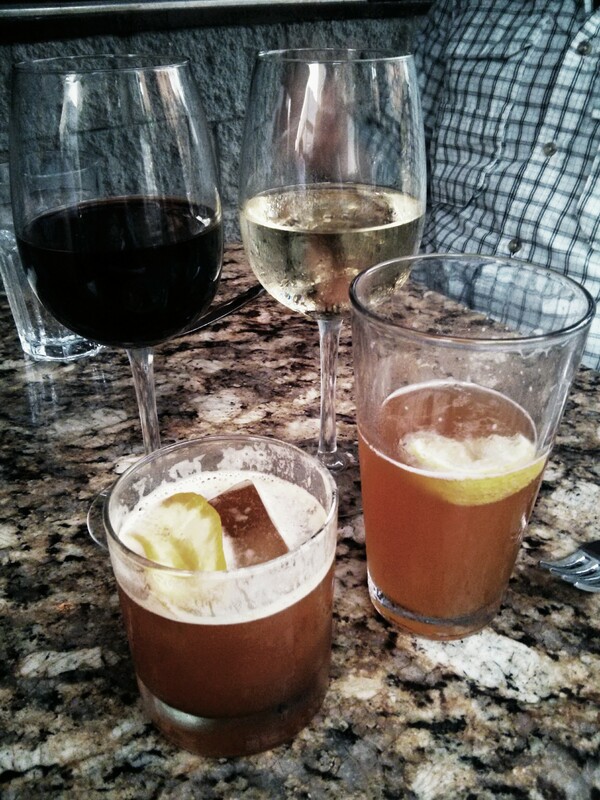 i think he could sense we were a lively bunch because he wasted no time getting our drink orders. i had already decided on the ravioli for my entrée, so in true kelsey fashion, i asked for a red wine that would pair with it well. oscar considered the drink menu for a moment and then suggested the cherry tart wine. “i’ll take it!” i declared. sometimes life is brilliantly simple. the rest of the table ordered as well and then oscar was off to tend to our spirits. i’ll take a line or two here to mention that this evening was turner’s first time to nrw. how exciting! she usually works on wednesdays but luckily found herself off that night. it was a great day to get to come because, let’s be honest, sometimes our crew can be exhausting and overwhelming. still love you guys! x’s and o’s! oscar returned with drinks for the table and a basket of bread to go with them. my glass of wine was light with a hint of berries, quite enjoyable! turner’s wine was nice, as were nathan’s beers. jon really liked the bitters in his sicilian sunset. his first few sips were quite large! jon had ordered the soup of the day to accompany the start to his meal. it was a tomato bisque with assorted seafoods, from mussels to clams to oysters. tomato soup is one of his favorites, and this bowl proved to be a winner as well. it was warm but not too hot that he couldn’t have a spoonful right upon its arrival. i am convinced it was gone in record time! 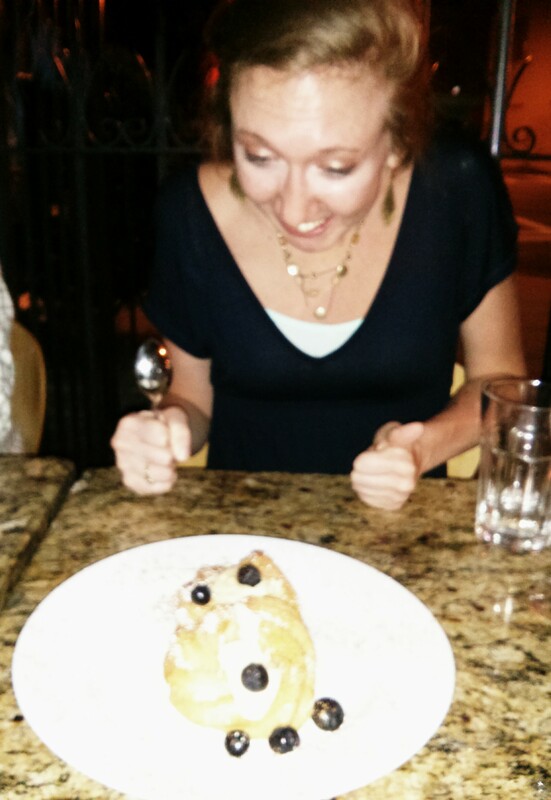 conversation was sparkling among us all, but our dinners arrived in a timely fashion to politely interrupt. before the plates even found the table, we were oohing and aahing over everything. first of all, the portions were not skimpy at all. even turner’s half portion of gigli looked like more than enough to make a meal. and second, it all just looked so crafted, truly handmade, which is the case of nearly all the menu items here at baraonda. there was no reason to wait once everyone was served, so we excitedly took our first bites. nathan had ordered the lasagna, solely upon the waiter’s recommendation. 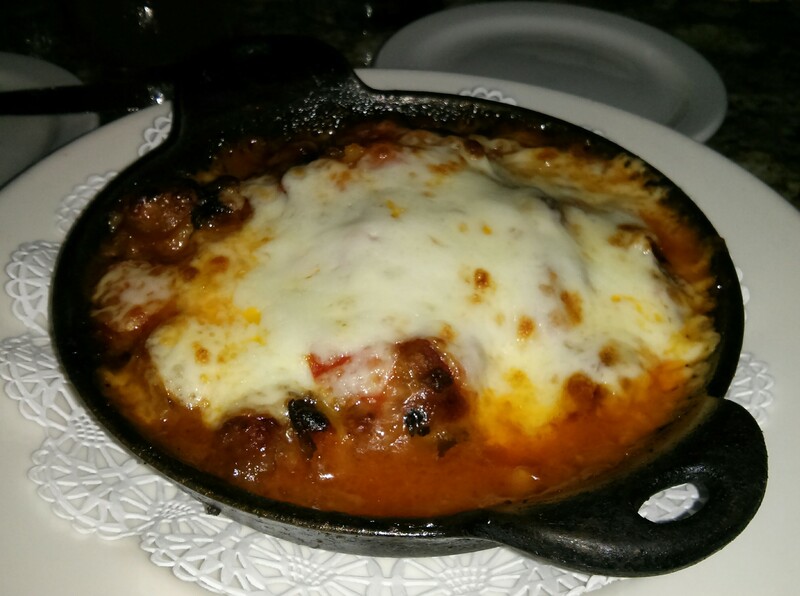 it was served in a small cast iron dish, a plating style i had never seen for lasagna. it was piping hot, still simmering around the edges. nathan isn’t one to leave a lot on his plate at a meal, and tonight was no exception. the lasagna was traditional and hearty with the beef ragu, bechamella, and mozzarella aplenty. he’d gladly order it again. turner’s bowl full of gigli looked so fun (and much more appealing than ben affleck and jennifer lopez’s flop of a film) that i almost wish i had ordered it as well. those flutey little noodles were surrounded by boar sauage and rapini. 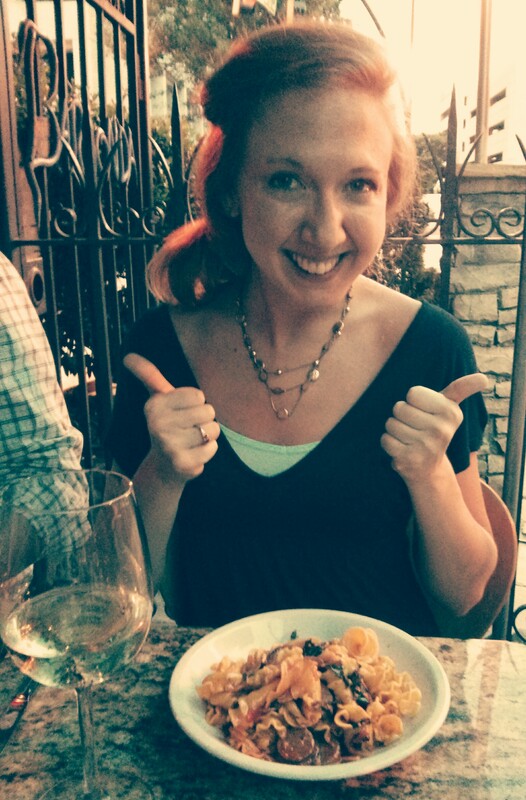 her dinner looked carefree and lighthearted, if pasta can actually take on those characteristics. 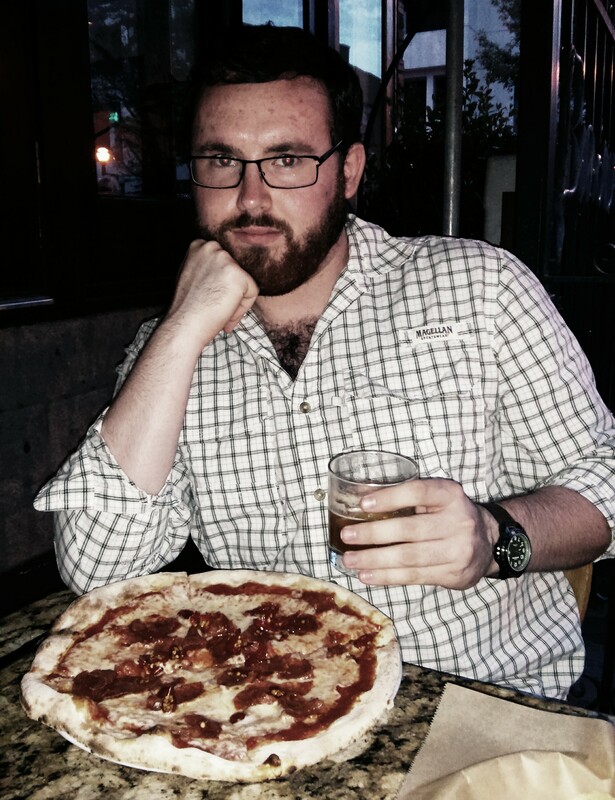 jon had decided on pizza that night and was pleasantly surprised when it was placed in front of him. i think we were all expecting a modest, personal-sized pizza, but this bad boy was certainly large enough to share. the fra diavolo pizza was hot and spicy due to the spicy salami and calabrese peppers, but it was just what jon was craving that night. 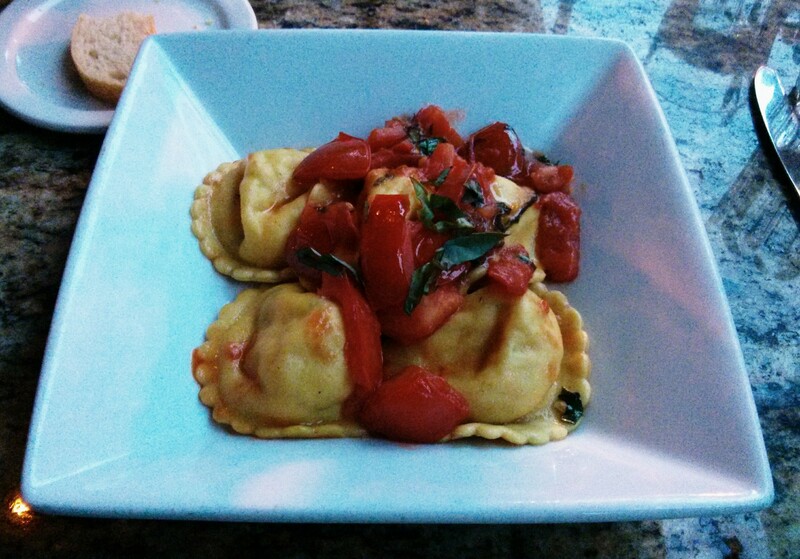 as for me, i just had to have the ravioli oscar had so wonderfully described. four cheeses in a light wine sauce and garlic sauce? i think so! the eggy pasta was homemade, something so obvious even before my first bite. each ravioli pocket was filled with such rich cheese, it’s a good thing there wasn’t a heavy sauce atop to overpower them. wait, did i mention the tomatoes? oh my, i could have devoured another helping of them quite easily. they were delicately roasted, juicy, and tender. my one and only qualm is that the dish was ever so slightly oversalted. but believe me, it was a meal worth finishing quickly. dinner had to end eventually, but that doesn’t mean the night had to come to a close. at least not just yet. turner sweetly asked for a dessert menu, you know, just so we could take a look. famous last words, right? oscar easily convinced us that a couple orders of baraonuts would be the perfect way to end our baraonda dining experience. sometimes we can be a pretty easy sell… it turns out that our italian doughnuts (aka, italian churros) were a great idea. like many dessert doughnuts i’ve had lately, the outsides were crispy and light with a doughy, almost gooey, filling that wasn’t overly sweet. the blueberries were a fine touch, but all i needed was that fried goodness! i’ll be honest, even after our sweet teeth were satisfied, i wasn’t ready to say goodnight! i would have gladly ordered another glass of wine; maybe i would have even bought one for oscar! but i suppose all good things must come to an end, yes? well, only if you insist.